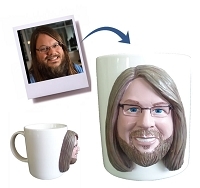 Trying to buy for someone that has everything, how about a Custom Mug featuring their face? You can add a mug to your existing order or order this amazing gift on its own. We will sculpt the mug to look like the photo you provide and make you a star gift give. So put your favorite Girl, Guy or Pet on a Custom Mug today and you're sure to put a smile on their face.